THIS ITEM IS NOT AVAILABLE AT PRESENT. WE WILL NOT BE GETTING ANYMORE Star Wars Forces of Destiny Endor Adventure Princess Leia Organa Adventure Figure. From the Star Wars Forces of Destiny collection by Hasbro. 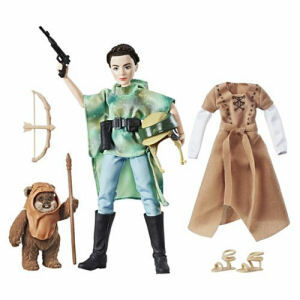 Star Wars Forces of Destiny Endor Adventure Princess Leia Organa Adventure Figure. These highly poseable 11- inch tall action figures feature beautiful rooted hair and a friendly sidekick.